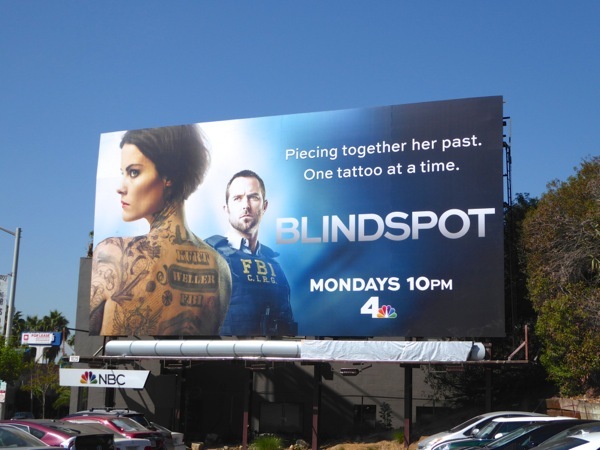 Finally NBC is showing a spark of originality with its new Fall show Blindspot, which finds Thor's Jaimie Alexander dumped naked in a bag in Times Square, New York, her body mysteriously covered in intricate tattoos, with no memory of what has happened. Helping this amnesiac 'Jane Doe' to piece together the clues covering her body in the most bizarre treasure hunt ever, is Strike Back's Sullivan Stapleton as FBI agent 'Kurt Weller'. He's got her back, or should that be he's on her back, literally. The actress is no stranger to making her debut naked or without her memory, as that's how she was introduced in ABC Family's Kyle XY sci-fi series as the experiment 'Jessi'. 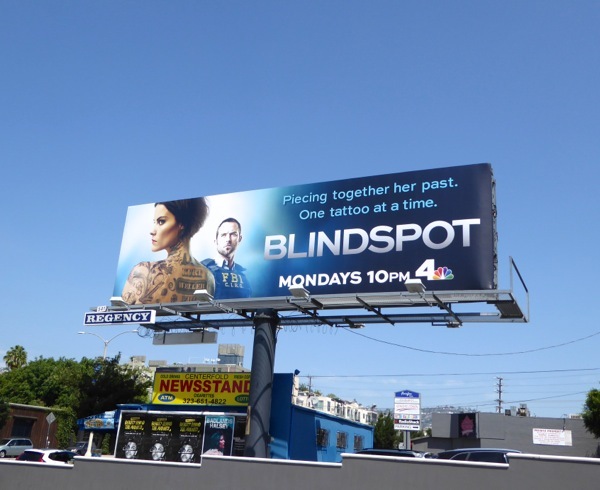 These striking Blindspot launch billboards instantly convey the premise of the show and were first spied along Fairfax Avenue on August 23, plus later above Beverly Boulevard on August 26, then snapped two days later along the busy Sunset Strip. 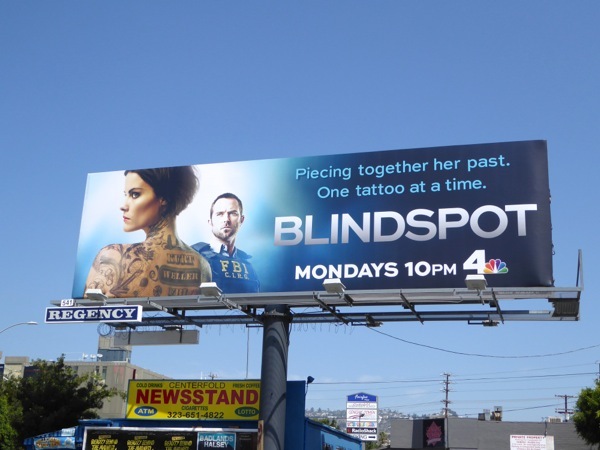 The tattoo theme of this key art also reminds Daily Billboard of the series premiere billboards for Dig from earlier this year. Admirers of Jaimie Alexander should also check her out in this giant Thor: The Dark World movie billboard and take a closer look at her Lady Sif costume from the Thor movies. 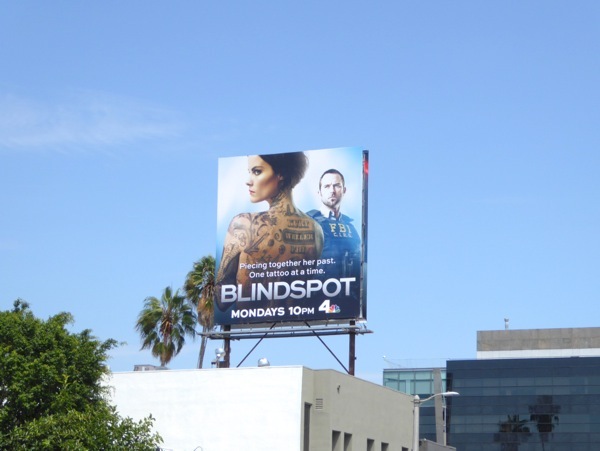 If you're a fan of Sullivan Stapleton, be sure to also take a look at these Strike Back season promo billboards and these 300: Rise of an Empire movie billboards. 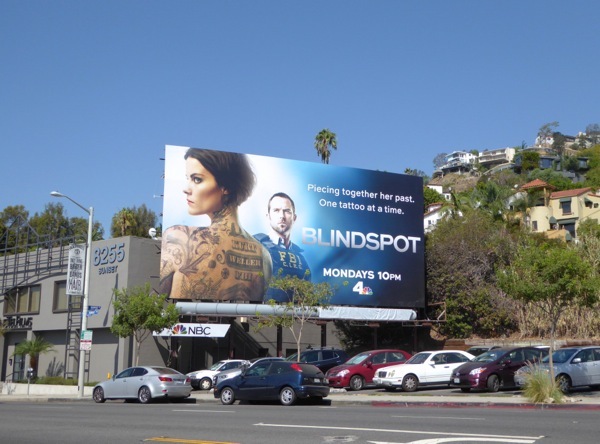 Let's hope that the show doesn't devolve into a 'tattoo of the week' procedural drama and that the grand plan behind the series hasn't been dumbed down for mainstream network audiences. 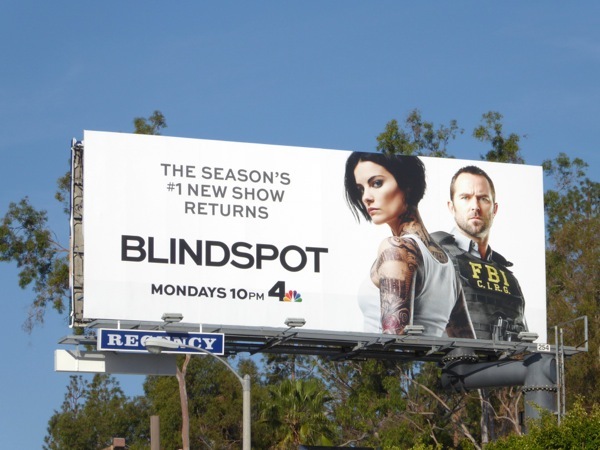 Stay tuned for even more TV shows Blindspot will be competing with this Fall, all vying for your viewing pleasure. 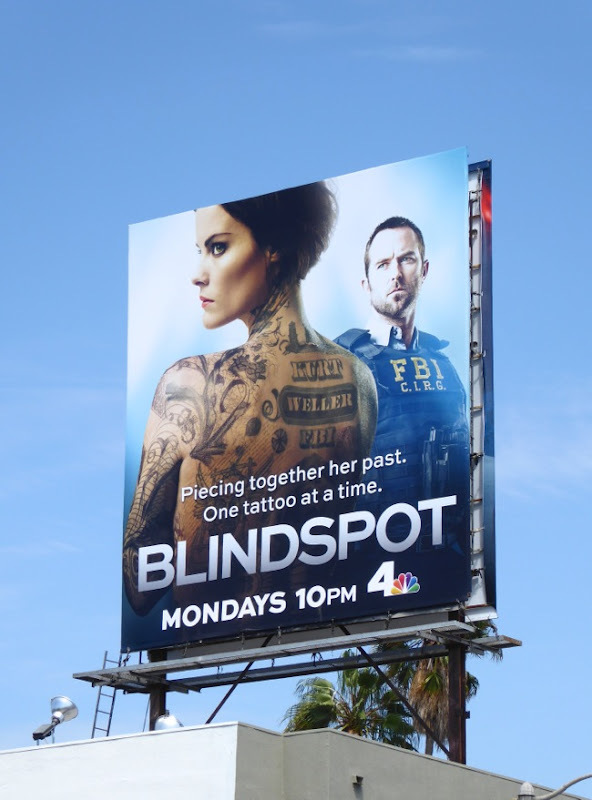 UPDATED: Blindspot was certainly one of the rookie winners of the Fall season and now it's back to see if it can keep its mystery and momentum going one tattoo at a time. 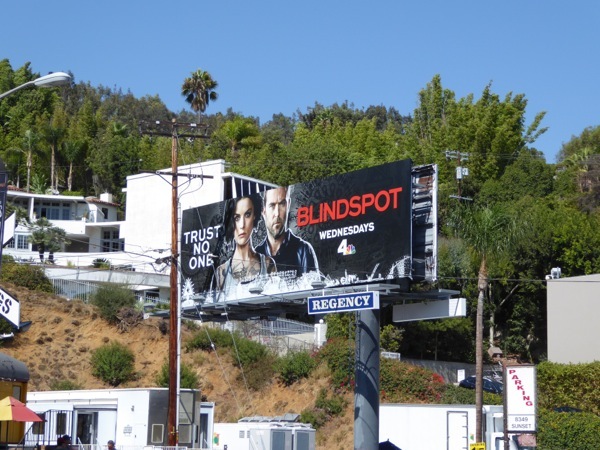 Here's the midseason billboard for the show's return spied along the Sunset Strip on February 20, 2016. 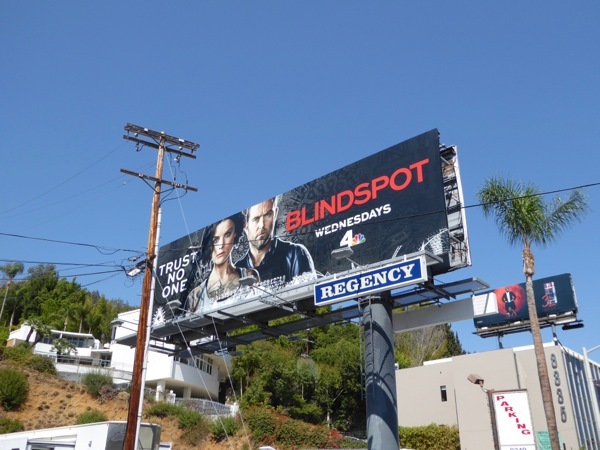 Can the clues, intrigue, romance and shocks keep coming for the rest of its debut season? 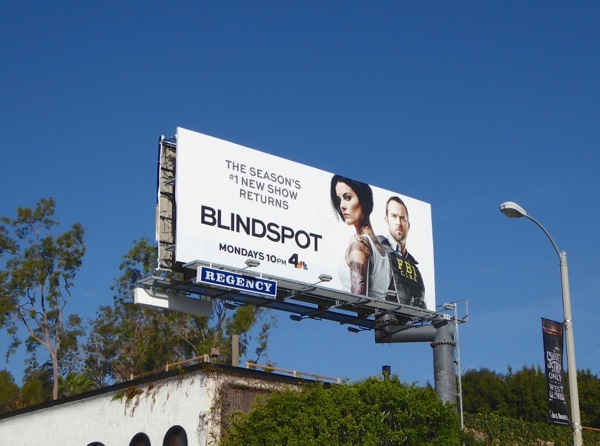 UPDATED: It only feels like yesterday that Blindspot's first season finale aired, but the show is already back for a second season on NBC, although on a new night. 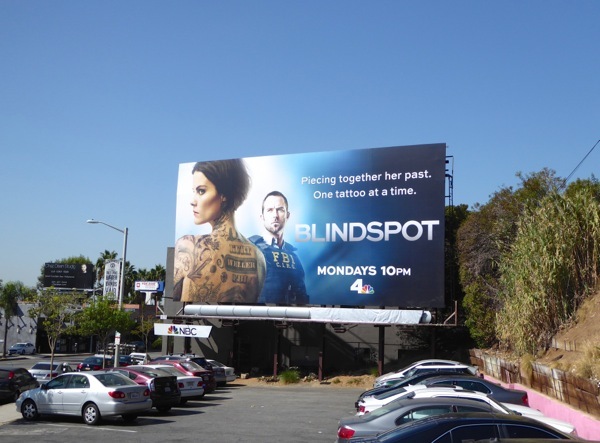 This sophomore season billboard with the show's headline stars was snapped along the busy Sunset Strip on September 14, 2016. Where will Jane's tattoos lead next?